Although he is one of its newest members, when it came to fundraising prowess, Elk Grove City Councilman Steve Ly performed like a seasoned pol during the first six months of 2015. According to financial disclosures filed with the Elk Grove City Clerk's office, during the six month reporting period ending June 30, the first-term council member raised $35,735. 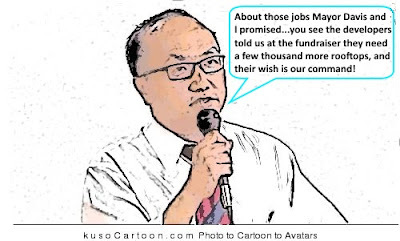 Like his city council colleagues have historically done, the lions share of Ly's donations came from real estate interests seeking to develop residential units in Elk Grove. Among major expenditures made by Ly were $10,000 each to Capitol Campaigns and Ross Communications. Ly reports he currently owes Capitol Campaigns $10,000 and $4,000 to Ross. Those potted plants have turned into Money Trees! Steve Ly is a joke. He has the backing of the Asian and Hmong population Many from outside the area and even state) who get out and vote. He has no idea what's going on on the dais, he seems lost and makes non-sensical comments often off topic or juvenile in nature. He promised he'd bring many jobs to Elk Grove, but as of yet hasn't delivered as much as a pizza delivery job here. He's a lazy, inept fraud. Mr. Ly is a very good case study of how politicians use their influence to build institutions that they reap personal benefit from. How successful would say a group of Basque language speakers been in receiving a community grant for a Saturday school if they approached the Elk Grove City Council? Short of making large contributions, without a patron on the council you can safely bet they would have no chance. Whether it be an over-sized grant for a under whelming exercise tournament or a language school that a council member has a hand in, the city council members will invoke their secret handshake, make their side deals, and approve each others personal pet projects while we, the taxpayers fund them. If you are not part of the council's inner-circle or made a significant cash contribution, forget about getting any grant money, no matter how worthy, if it doesn't some how politically benefit a council member. Does anyone remember what happened to the wrestlers last go around? Nice set up the council members have - they make the rules for the game that only they can win. Elk Grove is starting to look like a steaming dumpster fire of a suburban ghetto. We don't need more subdivisions filled with cheaply built tract homes. Elk Grove has a population of more than 150,000. Elk Grove is becoming such a dump that no city in Japan, South Korea, Australia, Taiwan, New Zealand, etc. would want to become a sister city of Elk Grove. So, he overspent in his campaign, then sold what little soul he had left to the developers and he still owes his campaign manager $10K? Daft and indebted, don't expect to see Ly make decisions in the best interest of Elk Grove. What I’m wondering today is since when did Money become the only Means to get what you want? When Money becomes the ONLY means of barter, you have once again sold your soul to the company store. In this case, the Developers. I think it should be a HUGH problem for our city when one of our council members still owes money from his 2014 campaign and is making decisions perhaps based on getting some contributions from those very same people. Word of caution here in looking over Ly’s list of “developer” interests. One sticks out, and in my opinion, not in a good way, Sheldon Business Park and Gyan Kalwani. Mr. Kalwani has been in the news a lot in the recent past and it appears he goes on trial this month. Kalwani was a generous supporter of former Councilman Mike Leary when Kalwani was pushing for Avenue A to go through. Leary tried with all his loutish might to get it passed, but to no avail. Looks like Kalwani may have found a new Leary. . . just take away the e, a and the r! @Anon 13:41 I'm not familiar with Avenue A. Is this out in Sheldon? Kalwani bought and paid for Ly's ear. Not all Asians support that guy. There is a marked difference between Asians whose families that have been here since the early 1900s and the Asians that came to this country one or two generations ago.